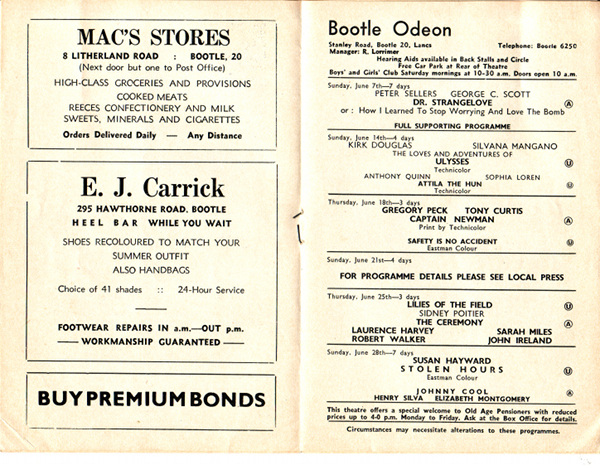 Cinema programmes were freely available within cinemas and used to promote new releases as well as local businesses. Film programmes changed frequently during the 30′s to the 60′s, often three times a week, and different cinemas would have different films showing, unlike today where films come out on general release and can be seen in every cinema at the same time. The films shown would depend on the cinema and what film circuit it was under. New films were released in what was called first runs or first release , these would generally go out to the larger circuit of cinemas first,usually in town centres before being released to surburban cinemas in what would be called the second run or second release, this could sometimes be weeks or months later. Films were also re – released, often years after their initial showing in cinemas, but as film programmes changed so frequently and often more than one film would be shown within the weekly program, a chance to see a film again was popular with cinema goers. The smaller cinema circuits and independent cinemas often struggled to get first or even second run films but as cinema going was such a popular pastime a screening of a re-release would be well attended. 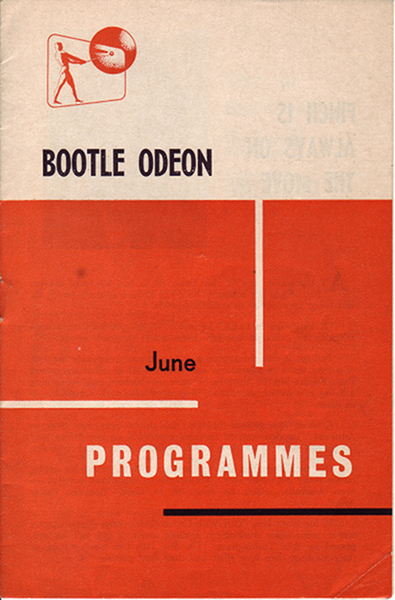 Here we have an original copy of a Cinema programme from Bootle Odeon June 1963. in the programme there were two re-releases from 1954 , ‘Ulysees’ and ‘Atilla the Hun’, both films were described as ‘Sword and Sandals’ films, but were still popular with audiences almost nine years after original first release.